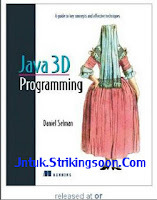 Java 3D is a client-side Java application programming interface (API) developed at Sun Microsystems for rendering interactive 3D graphics using Java. Using Java 3D you will be able to develop richly interactive 3D applications, ranging from immersive games to scientific visualization applications. Click Here For Full Material!